Paterson, New Jersey, was known as the "Silk City of America". More than one-third of its 73,000 workers held jobs in the silk industry. High-speed automatic looms were introduced into the factories at the beginning of the 20th century. In 1911 silk manufacturers in Paterson decided that workers, who had previously ran two looms, were now required to operate four simultaneously. Workers complained that this would cause unemployment and consequently, would bring down wages. On 27th January, 1913, 800 employees of the Doherty Silk Mill went on strike when four members of the workers' committee were fired for trying to organize a meeting with the company's management to discuss the four-loom system. Within a week, all silk workers were on strike and the 300 mills in the town were forced to close. Bill Haywood, Carlo Tresca, and Elizabeth Gurley Flynn of the Industrial Workers of the World arrived in Paterson and took over the running of the strike. Flynn held successful weekly meetings for women only. During the dispute over 3,000 pickets were arrested, most of them received a 10 day sentence in local jails. Two workers were killed by private detectives hired by the mill workers. These men were arrested but were never brought to trial. However, as Bertram D. Wolfe pointed out: "It is hard work to fill Madison Square Garden. The dollar and two-dollar seats remained almost empty until workers and strikers were let in free or at ten cents a seat. Instead of making money, the pageant ended with a deficit." The strike fund was unable to raise enough money and in July, 1913, the workers were starved into submission. 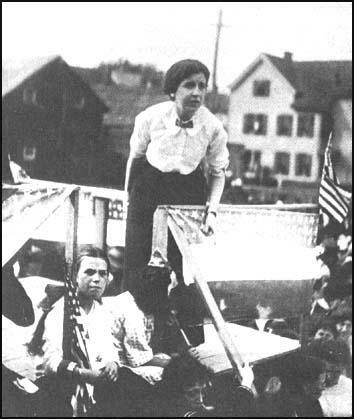 Elizabeth Gurley Flynn defended the way the Industrial Workers of the World run the campaign: "What is a labour victory? I maintain that it is a twofold thing. Workers must gain economic advantage, but they must also gain revolutionary spirit, in order to achieve a complete victory. For workers to gain a few cents more a day, a few minutes less a day, and go back to work with the same psychology, the same attitude toward society is to achieve a temporary gain and not a lasting victory. For workers to go back with a class-conscious spirit, with an organized and determined attitude toward society means that even if they have made no economic gain they have the possibility of gaining in the future." (1) Leonora Barry published a report for the Knights of Labor in 1887. March 14 was sent to Paterson to look into the condition of the women and children employed in the Linen-thread Works of that city. There are some fourteen or fifteen hundred persons employed in this industry, who were at that time out of employment for this reason: Children who work at what is called doffing were receiving $2.70 per week, and asked for an increase of 5 cents per day. They were refused, and they struck, whereupon all the other employees were locked out. This was what some of the toadying press called "Paterson's peculiar strike," or "unexplainable phenomena." The abuse, injustice and suffering which the women of this industry endure from the tyranny, cruelty and slave-driving propensities of the employers is something terrible to be allowed existence in free America. In one branch of this industry women are compelled to stand on a stone floor in water the year round, most of the time barefoot, with a spray of water from a revolving cylinder flying constantly against the breast; and the coldest night in winter as well as the warmest in summer those poor creatures must go to their homes with water dripping from their underclothing along their path, because there could not be space or a few moments allowed them wherein to change their clothing. A constant supply of recruits is always on hand to take the places of any who dare rebel against the ironclad authority of those in charge. The textile industries rank first in the enslavement of children. One evening, not long ago, I stood outside of a large flax mill in Paterson, New Jersey, while it disgorged its crowd of men, women, and children employees. All the afternoon, as I lingered in the tenement district near the mills, the comparative silence of the streets oppressed me. There were many babies and very small children, but the older children, whose boisterous play one expects in such streets, were wanting. At six o'clock the whistles shrieked, and the streets were suddenly filled with people, many of them mere children. Of all the crowd of tired, pallid, and languid-looking children I could only get speech with one, a little girl who claimed thirteen years, though she was smaller than many a child of ten. Indeed, as I think of her now, I doubt whether she would have come up to the standard of normal physical development either in weight or stature for a child of ten. One learns, however, not to judge the ages of working children by their physical appearance, for they are usually behind other children in height, weight, and girth of chest, - often as much two or three years. If my little Paterson friend was thirteen, perhaps the nature of her employment will explain her puny, stunted body. She works in the "steaming room" of the flax mill. All day long, in a room filled with clouds of steam, she has to stand barefooted in pools of water twisting coils of wet hemp. When I saw her she was dripping wet though she said that she had worn a rubber apron all day. In the coldest evenings of winter little Marie, and hundreds of other little girls, must go out from the superheated steaming rooms into the bitter cold in just that condition. No wonder that such children are stunted and underdeveloped. When the broad silk weavers in Henry Doherty's mill in Paterson, New Jersey, left their machines last February they inaugurated what has proved to be the closest approach to a general strike that has yet taken place in an American industry. 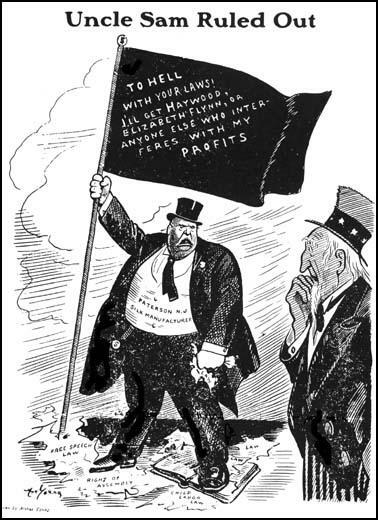 At present no less than 50,000 silk workers are on strike in New Jersey, Pennsylvania, New York and Connecticut. For a few electric moments there was a terrible unity between all of these people. They were one: the workers who had come to show their comrades what was happening across the river and the workers who had come to see it. I have never felt such a pulsing vibration in any gathering before or since. When the police, who had arrested him (John Reed) "for resisting an officer," found that he was embarrassing them by articles on prison conditions, they threw him out. He headed straight for Mabel Dodge's home. Since it was her idea, he took it for granted that she would work with him on it. His exuberance dragged her into an enterprise alien and indifferent to her nature. Thus was born "The Pageant of the Paterson Strike." His scenario was rather bare and simple. But the novelty of masses of strikers and I.W.W. leaders as actors gave the performance an unexpected intensity. Jack appeared in his own pageant to lead the strikers in revolutionary songs. It is hard work to fill Madison Square Garden. The dollar and two-dollar seats remained almost empty until workers and strikers were let in free or at ten cents a seat. Instead of making money, the pageant ended with a deficit. The long strike was finally lost. But Jack did not stay to learn the results. The day after the pageant, he and Mabel left for Europe.